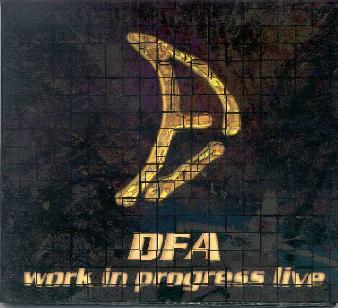 DFA - "Work In Progress Live"
DFA (Duty Free Area) is a guitar, bass, keyboards, drums, and vocals quartet from Italy that plays complexly arranged progressive rock with heavy jazz fusion influences. They have two studio releases to date and Work In Progress Live documents their performance at the Nearfest 2000 festival in Pennsylvania. The musicianship is impressive as each member carves his own distinct identity while at all times retaining the ensemble element in their music. Numerous analogies come to mind... ELP, early Camel, Mahavishnu Orchestra, and other diverse influences. More current analogies might include Deux Ex Machina (but without the vocal gymnastics). The music is mostly instrumental and the band excels at stop-on-a-dime rhythmic shifts. "La Via" is a great track that is a bit different than the others. Much darker, more theatrical. The music builds tension slowly and there's a sense that a story is being told. But when the band kicks in the music is also more heavy driving rock oriented. As the music develops I hear bits of ELP, Genesis, lots a ambient bits, and the proggy jazz fusion that seems to be a trademark part of the bands sound. This may sound strangely diverse but I'm just rattling off things I hear and this 16 minute epic really does evolve in a coherent manner throughout. "Pantera" is standout track in which the keyboards are front and center stage. The ELP influences are apparent though this is the most overtly jazzy tune on the CD. Some killer piano playing too! And "Ragno" is my favorite tune on the disc. The music is mucho intense and has some of the best playing of the set. Killer guitar work and some great 70s keyboard sounds. It has kind of a jazzy fusion ELP sound. Things get a bit freaky at times too indicating these guys can say the hell with control and get wild and crazy when they want to. An excellent progressive rock and fusion band. For more information you can visit the DFA web site at: http://digilander.iol.it/dfa/. Work In Progress Live is distributed by Moonjune Records. You can visit their web site at: http://www.moonjune.com/.